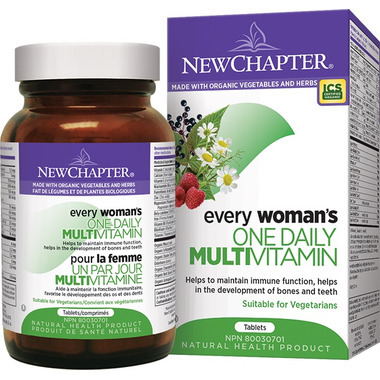 New Chapter Every Woman's One Daily Vitamin & Mineral Supplement helps to maintain immune function, helps in the development of bones and teeth. Recommended Dose: Adults—Take 1 tablet daily with food. Take a few hours before or after taking other medications. My daughter takes these vitamins daily especially during winter months. I have tried many multivitamins, but this one actually makes me feel great. The last few months I have had low energy, but after just a week of taking these my energy levels are back up. I usually take it right after breakfast, because it is a little hard on the stomach. Definitely will keep buying! I've been using these vitamins for months and I love them. Great all-in, once-a-day multivitamin. All natural. Delicate on the stomach. Doesn't contain sufficient calcium, however; have to supplement it. Very happy with this product. Gives me energy to get through the day. Best multivitamin I tried so far. High quality, gentle and easy on stomach.